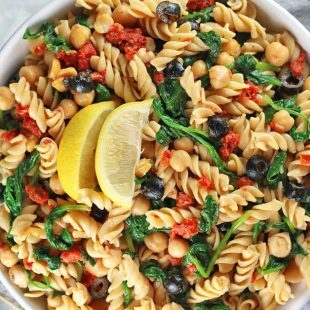 This Easy Vegan Pasta Salad comes together so quickly. 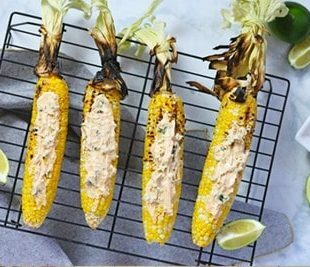 It’s perfect when you need a healthy and tasty dish to bring to a cookout, BBQ, or potluck. It can be made ahead of time for a fast and delicious gluten-free dinner or lunch. Summer is the time for relaxing, hanging out with family & friends, and outdoor eating. One of my favorite things to bring to potlucks, barbecues, potlucks, and cookouts are pasta salads. 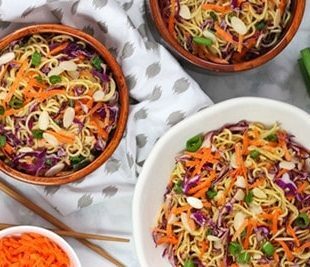 My Vegan Ranch Pasta Salad and Healthy Ramen Noodle Salad are two of my most popular recipes. Today I’m sharing another easy vegan pasta salad with you that I think you’ll also love. 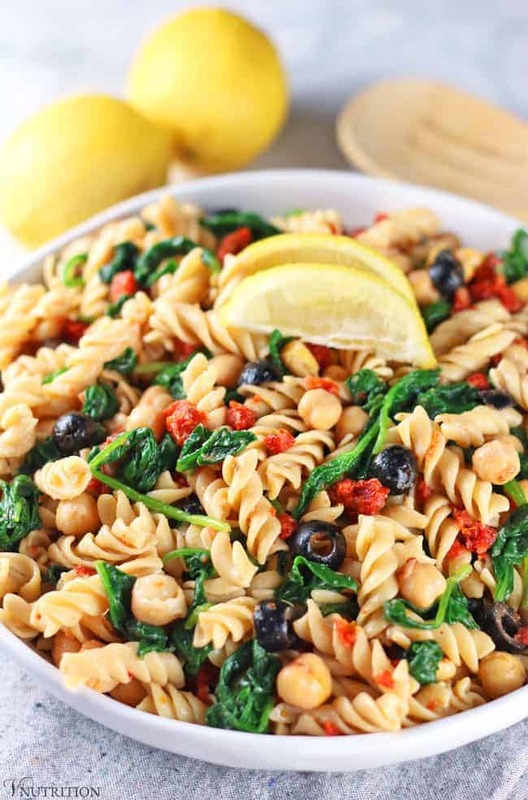 This easy vegan pasta salad is simple and delicious. This dish came together really out of necessity. I had a BBQ one day last summer and I put off making the food I was bringing until last minute. I realized too late that I didn’t have all the ingredients I needed for the meal I was going to make so I had to think quickly. Quick needed to be the name of my game that day so I used what was on hand. I luckily had spinach, chickpeas, sun-dried tomatoes, basil, and kalamata olives (some of my staples- all which paired very nicely). I made sure this vegan pasta salad was easy to put together becasue I was in a rush. It took me about 15-20 minutes in total from start to finish (including cooking the pasta). And guess what? Everyone enjoyed it! I love that this pasta salad can be made ahead of time too. This way you don’t have to be running around the day of the get-together freaking out that whatever you’re bringing is going to take 2 hours to make (like I did). I feel like some pasta salads add too much oil and have too little substance besides pasta. This recipe only uses a few tablespoons of oil for the whole dish. However, since I’m not using a highly processed vegetable oil feel free to add a little more if you want because extra virgin olive oil is heart healthy. 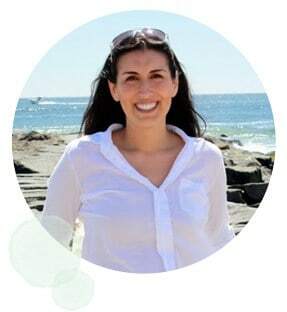 Check out my Fats: the good, the bad, and the in-between post for more info on healthy fats! I included chickpeas for an extra kick of protein. Chickpeas also contain fiber, iron, vitamin B6, and important electrolytes like magnesium and potassium. The olives and sun-dried tomatoes add flavor as well as some healthy fat, vitamin C, and beta-carotene. I hope you enjoy it as much as I do and have a wonderful holiday weekend! 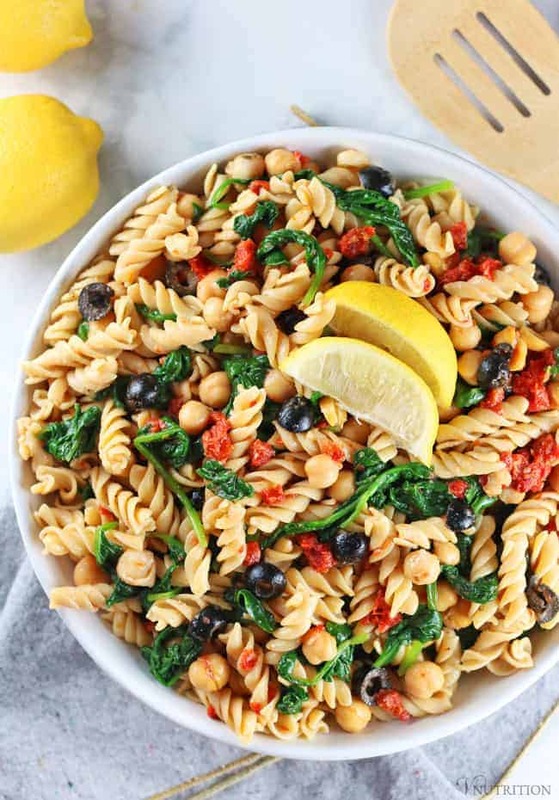 This Easy Vegan Pasta Salad comes together so quickly. It's perfect when you need a healthy and tasty dish to bring to a cookout, BBQ, or potluck. It can be made ahead of time for a fast and delicious gluten-free dinner or lunch. While pasta is cooking, add a few tablespoons of veggie broth or water to large pan/skillet . Add the spinach and cook until just wilted. Put sun-dried tomatoes and basil in food processor and pulse till chopped. You don't want to do it too much to make it into a paste, you just want it chopped. 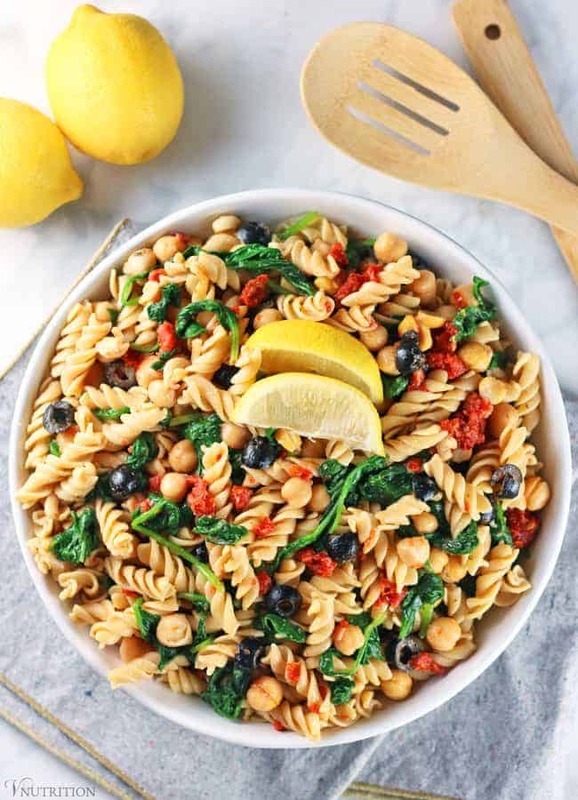 Drain and rinse chickpeas and put in large bowl along with the cooked spinach, olives, and sun-dried tomato/basil mixture. When pasta is done rinse with cold water and add to the bowl along with the rest of the ingredients. The salad will keep in the fridge for 3-5 days. I’ve never had orzo, but I think fresh pasta salads are one of my favorite parts about summer. Yes Emily, I agree, I love pasta salads in summer! I hope you had a great weekend Christine! Ah summer!!! Perfect potluck pick =) I like how you can make it ahead of time too. I’ve been getting trapped into making food right before a potluck and then end up running late for it. Thanks Kimmy! I’m always running late before going somewhere too if I’m trying to make some thing for it. This looks delicious – and so simple to make! Thanks Deborah! The sun-dried tomatoes really added that extra little kick I thought it needed. I’ve never tried making anything with orzo, but I need to! :O This looks so good! :]!! Oh man! I don’t even know when I’ve last had orzo! I feel like I should try this out. You should – and let me know what you think! I haven’t had orzo in forever before I thought about making this. I was going to use bowtie pasta but thought the orzo would be a bit better in this recipe. Thanks so much Angela! I thought the chickpeas would be a nice little addition and add a punch of protein. ? So healthy and delicious! My friends and family will eat this up! I am so delighted that you shared your delectable Summer Orzo Salad with us at the Healthy Happy Green Natural Party! I’m Pinning and sharing this! Great salad! I love the chickpeas in it and all the Greek flavours. This looks so fresh and colourful, definitely be going in my next picnic! 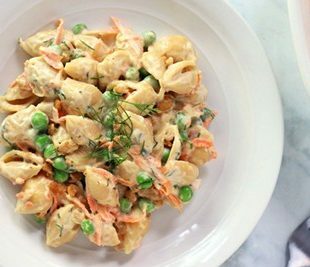 This looks delicious – I love a good pasta salad! Orzo salad is the perfect pasta but rotini works well too! Just so you know, your recipe says orzo but the photos have rotini pasta, still delicious!! Thanks for the recipe. 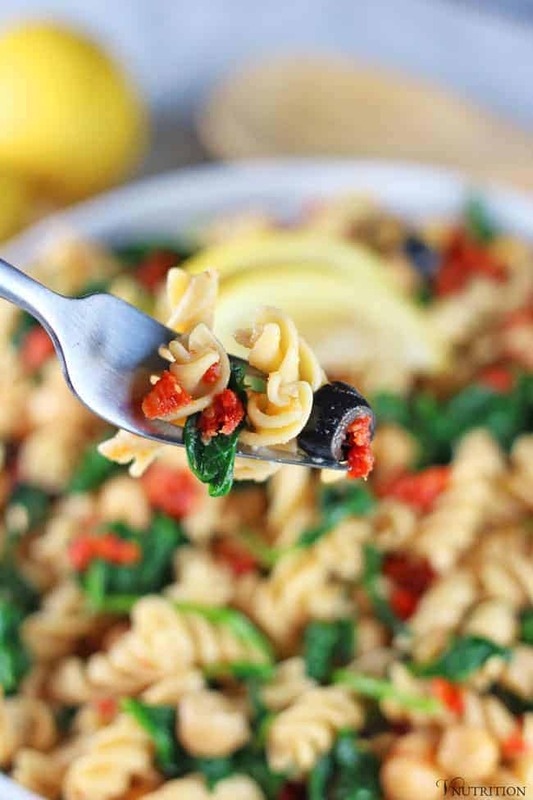 Summer calls for easy pasta meals like this one – especially when it’s 117 degrees outside!!! That was our temperature yesterday. Yikes! Thanks for this delicious idea. SO much flavor and love the addition of chick peas!